I only have 2 words to describe my 3 weeks with the BlackBerry 9530 (Storm): epic fail! From the day the Storm was announced it was clear to me that some nasty weather was heading this way from Canada. Hold this thought as a segue for moment. I’ve always been primarily interested in media creation/consumption devices, like Nokia’s Nseries and Apple’s iPhone – business phones are typically not my cup of tea. As a result, I didn’t try Windows Mobile until the Samsung BlackJack. and vowed to avoid that OS in the future. Similarly, I didn’t try a BlackBerry until the Curve v1.0 (the 8320 – arguably the first proper media-capable phone from Waterloo), but surprisingly, I was quite impressed (ditto the Nokia E71). With the Curve, I was not so much impressed with the push email and other enterprise features as I was with the fast and simple user experience, keyboard, WiFi with UMA, standard 3.5 mm audio connector, micro-SD slot, and decent camera. 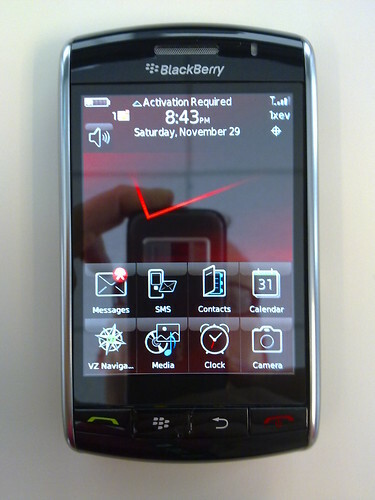 And that brings me back full-circle to the Storm, a BlackBerry without a physical keyboard or WiFi. What were they thinking? Let’s address the keyboard first, as this is the Storm’s Achilles’ heel. The lack of physical keyboard is a not a deal-breaker for me per-se, since I enjoy the on-screen keyboard on my iPhone – in fact I prefer it to my HTC Dream/T-Mobile G1‘s physical keyboard, because I never struggle to read the key labels. I also find the Nokia 5800‘s on-screen keyboard quite usable, despite the resistive touch screen. The problem with the Storm’s keyboard is “SurePress” which requires the user to physically press the entire screen to type a letter or make a selection. This concept is so utterly flawed, it makes using the Storm an exercise in frustration. Consider this: thanks to multitouch on the iPhone, you can begin touching the next key while still touching the previous key, allowing you to type very fast – accuracy is enhanced by clever software that, amongst other things, enlarges the touch area for those keys that are statistically more likely to be touched. On the Storm you have to touch a key, physically press the entire screen, wait for the screen to bounce back, and then touch the next key – rinse and repeat. Until you try it you can’t even begin to imagine how irritating this is. Except for James Kendrick, everyone who’s played with the Storm’s on-screen keyboard so far, from press, to bloggers, to my friends (even non tech-savvy ones) have absolutely hated it. This brings me to the next problem. Menu selection with “SurePress” is inaccurate – there’s nothing sure about it. Adding touch to an existing interface is certainly not trivial and possibly even more difficult than starting from scratch. Nokia faced this problem when adding touch to Symbian, and solved it by requiring the user to double-tap for some menu selection. It’s far from ideal, but I think it’s more intuitive than having to press the screen on the Storm. Of course, nothing prevents a future software update from letting the user disable “SurePress”, while implementing a standard on-screen keyboard, and allowing the user to double-tap for menu selection. I also think it was a mistake to omit the awesome trackball from the Storm – look no further than the G1 for a device with both a touch screen and a trackball. Finally, there’s the matter of speed, or lack thereof. Everything on the Storm is slow and buggy, even with the latest software. This is a shame, especially when you consider how responsive BlackBerry devices typically are. It takes between 2 and 3 minutes for the OS to boot (I timed it) – that’s up to 3 minutes between inserting the battery and being able to make an emergency call. Assuming you even still care at this point, is there anything good about the Storm? Yes, absolutely… The device is quite attractive and well made (it looks and feels better than the iPhone to me). The camera is fantastic – it blows away the competition and is also available on the Curve v2.0 (8920). Despite the mediocre set of included applications (when compared to the iPhone or the G1), there’s a bunch of nice 3rd-party native and Java applications available for the Storm, like Opera mini, Google Maps, Gmail, and TwitterBerry. The Storm features a Gobi radio from Qualcomm. This means it works on both CDMA networks and GSM/UMTS networks. As such, it can be unlocked and used all over the world. It supports EVDO (of course), GSM/GPRS/EDGE (quad-band), and UMTS/HSDPA (2100, Europe/Asia). I used it primarily with T-Mobile and it worked very well. I have the storm, I definitely agree that it is too slow. you can disable it, choose “Multitap” in Options – Screen/Keyboard – Portrait view keyboard. I can’t believe that ANYONE is content with the texting/typing capability – or lack thereof – of the Storm. The reaction of the SurePress screen is just too slow – crazy slow! Whose brain thinks this slowly? Surely not the engineers who developed this phone! Did they think we wouldn’t notice? The people at the store assured me that I just needed some time to get used to the “new feel” of the Storm. Don’t fall for it like I did! Great advice, i am seeing here different commands also thanks for sharing. Are there any forums that you recommend I join ?